It does suffer from the same demon as Conversation does; the Beast of Ludonarrative Dissonance. In both games, the setting and story of the game is a literal text, which the player is expected to read over the course of a level. Some elements of the games support this: the player must pay attention to the words in order to succeed at the ludic, or game, half of the work. Other elements don’t. Conversation distracted too much with its “interesting words,” I think, so that comprehension went down whenever a red word was on screen: the opposite of the intended effect. axcho’s “Words” does better at this aspect. Because you’re matching the actual spelling of words against each other, it’s easier to absorb the words’ meanings as long as you can read them at a high level and a low level simultaneously. I’m not sure how well the game flow works, though. Conversation‘s intended flow was one of backtracking and rereading; the reader’s eye hops ahead in the text, spots interesting words, and then backs up to review the relevant passage once those words are taken care of. It somewhat mirrors how I read books. “Words,” on the other hand, I played in a more disjointed manner. I spotted a word that looked like it would crop up again, jumped ahead to spot the same word, jumped back… typographical similarity doesn’t have any guaranteed relevance to meaning, although similar words tend to connect to each other in an etymological and poetic sense. Additionally, there’s the issue of pacing. A lot of folks found Conversation way too slow. This is partially because I limited the game speed in an attempt to encourage players to actually read the texts. “Words” doesn’t impose this. You can hold the down button or just jump off the edge and go through the entire level in no time at all. It means players will feel less bored, but it’s another thing that’s at odds with actually reading the text, unless you’re a speed-reader like me. The main issue I had with “Words,” though, was that the story was too interesting. Because of the aforementioned ludonarrative dissonance, the ludic elements distracted from the text, so I eventually just stopped playing and started reading. The story is a mashup of Where the Wild Things Are, Ishmael, and Haida myth. As I’m unfamiliar with the latter two, it felt like Where the Wild Things Are told by Homer or the writer of Gilgamesh or Beowulf. Max doesn’t just romp around with the monsters; he conquers their continent through bloodshed and murder. Interesting stuff. Also check out axcho’s “dRive,” which is my new favorite game about calculus and glitch music. Wow, this is the best feedback I’ve gotten yet! When I asked for your opinion I never expected to get a whole blog post. :) Thank you so much! It’s very interesting to get your perspective on this, especially about how the experience relates to reading. 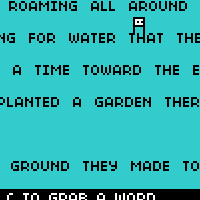 I think you’re right that the story was too interesting here – I actually wasn’t thinking so much about making a game to go with a story as much as making gameplay that I could plug into any random text to get automatic free level design! :p As is apparent with this prototype, I’m not quite there yet. The gameplay just isn’t fun enough. It’s reading the text that makes the game, i like it!